(MP034). W L Wyllie (1851-1931). 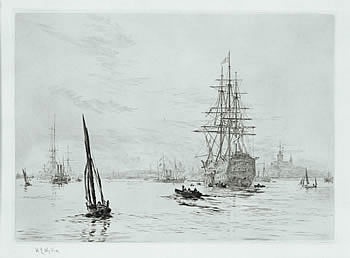 Etching, signed..
Another beautifully executed etching by Wyllie of HMS VICTORY whilst she was still afloat in Portsmouth  she wasn’t moved into the dockyard until December 1921 and her present dry dock until 12 January 1922. Ahead of her in this etching is a rare bird, however: HM Yacht ALBERTA a very attractive twin funnelled paddler commissioned in 1863 for Queen Victoria’s short haul’ voyages such as from Portsmouth to Osborne Castle on the Isle of Wight. What exactly is the occasion Wyllie is portraying? It was, incidentally, during the voyage over from Osborne to Portsmouth when VICTORIA & ALBERT II was accompanying ALBERTA carrying the Queen’s coffin, that the King observed V&A’s Royal Standard was half masted. Declaring that “The King of England lives” His Majesty forthwith commanded that the Standard be raised, a precedent that has remained unchanged although we do know from photographic evidence and a pencil and grey wash painting by Wyllie of ALBERTA entering Portsmouth with the Queen’s coffin, that the Yacht was permitted to wear Her Majesty’s Standard at half mast.